Crane’s Trevor Funcannon participated in the 2018 Missouri FFA Public Speaking Academy on the University of Central Missouri campus on June 5 -7. 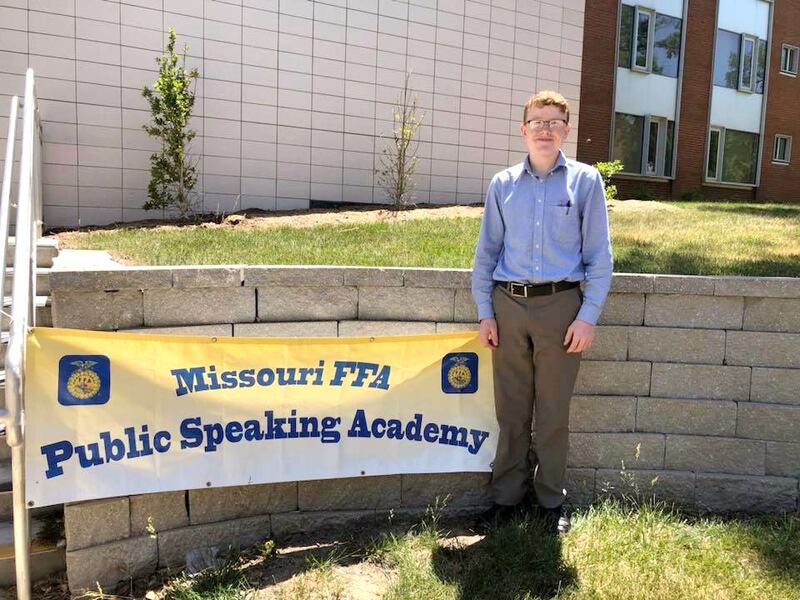 Sixty-six FFA members from across the state, including Trevor Funcannon, of Crane, participated in the Missouri FFA Public Speaking Academy held June 5-7, 2018 on the University of Central Missouri campus. During the three-day event, FFA members used the Internet and other communication technology to develop and refine an effective speech. Dr. Terry Cunconan, Dr. Wendy Geiger, Dr. Sam Cox, and Dr. Nikki Freeman from the University’s Speech Communication Department conducted the three days of intense learning. The academy was designed to help FFA members increase their confidence, develop organizational skills, use language effectively, analyze audiences and improve speaking skills by judging themselves honestly and critically -- while keeping a positive attitude. Each student presented his or her speech in competition at the conclusion of the academy. Awards were presented at a banquet held at the Ozark Room of the University Conference Center on Thursday, June 7, 2018. The banquet included the presentation of certificates of completion to each of the participants and recognition of the winners in each division. The finalists in each division (Beginners, Intermediate, and Advanced) were presented plaques and a State Public Speaking Pin from the Missouri FFA Association. Case IH was the primary sponsor for this year’s academy. The academy was also sponsored by Seitz Fundraising, Harmison’s Hometown Fundraising, University of Central Missouri Communications Department and UCM’s Ag Club, and the Missouri FFA Association. Assisting with the three-day conference were State FFA Officers –Allie Lock, State Vice-President of the Carrollton FFA Chapter, Andi Montgomery, State Vice President of the Everton FFA Chapter, Regan Ragsdale State Secretary of the Paris FFA Chapter, and Hannah Viets, State Vice President of the Sweet Springs FFA Chapter. Jessie Peterson served as a valuable intern for the event. The Conference Coordinator for the academy is Marie Davis, Northeast District Supervisor for Agriculture, Food and Natural Resources Education in Missouri’s Department of Elementary and Secondary Education.